Inside The Weird, Weird World Of Scientology! L. Ron Hubbard is the man behind Scientology and as we already know, Scientology is at the root of the split between Katie Holmes and Tom Cruise. This weeks’ National Enquirer has decided to give us a break down of how Hubbard’s weird science fiction desires eventually became a well-oiled cult. Supposedly Scientology got its start during a chat between Hubbard and sci-fi writer, John W. Cambell. Hubbard realized that the best way to get rich and avoid taxes was to “start your own religion”. Bingo, Scientology was born. Hubbard created it as a successor to his earlier, wildly popular Dianetics self-help program. He realized Dianetics made him a mint so a full scale religion seemed a logical next step. In 1953 Hubbard incorporated three churches called a Church of American Science, a Church of Scientology and a Church of Spiritual Engineering, in Camden, New Jersey. 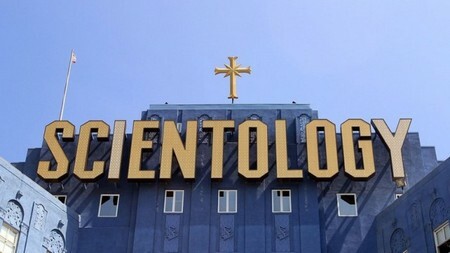 The movement spread quickly and soon churches called Scientology were popping up in California. In 1966, Hubbard stepped down as executive director of Scientology in order to devote himself to research and writing. He then went on to form the Sea Organization, an elite group within Scientology that was based on three ships, the Diana, the Athena, and the Apollo. He continued his search for spirituality until his death in 1986. Scientologists believe “a precise path leading to a complete and certain understanding of one’s true spiritual nature and one’s relationship to self, family, groups, Mankind, all life forms, the material universe, the spiritual universe and the Supreme Being.” Everything they believe to be true is rooted in a core belief of the “Thetan”. Thetan, is the individualized expression of the cosmic source, or life force. Thetans fell from grace when they began to identify with their creation, rather than their original state of spiritual purity. Having lost their memory of their true nature, thetans are reborn time and time again in new bodies through a process called “assumption,” which is similar to reincarnation. Just in case you aren’t already confused there are numerous advanced teachings of Scientology that are based on advanced teachings and the story of Xenu — the tyrant ruler of the Galactic Confederacy — who 75 million years ago brought billions of people to Earth in spacecraft resembling Douglas DC-8 airliners, stacked them around volcanoes and detonated hydrogen bombs in the volcanoes. The thetans then clustered together, stuck to the bodies of the living, and continue to do this today. I am utterly baffled as to why so many Hollywood celebrities have latched onto and choose to live their lives in accordance with these teachings. What I do know is that the split between Tom cruise and Katie Holmes is going to launch this cult into the media forefront for a long time and it’ll be interesting to see how the Scientology spokespeople handle it. What are your thoughts on these crazy teachings? Tell us your thoughts in the comments below.